I received this book for free from Harper Collins Children's Books in exchange for an honest review. This does not affect my opinion of the book or the content of my review. What can I say about Solitaire that will convey my thoughts on just how perfect it is? I’ve been eagerly anticipating reading it for months now and so I started it as soon as I opened the parcel containing it. Solitaire tells the story of Victoria Spring, whose hobbies include sleeping, blogging and drinking diet lemonade. Tori is a pessimist and prefers her own company to spending time with others. Things used to be different: she had friends and her brother, Charlie, was okay, but now things are different. When things start happening around the school, harmless pranks which then turn into something bigger, Tori is left wondering who’s behind it – who are Solitaire, and what are they trying to achieve? – and also trying to live with her own inner struggles. Solitaire is a gorgeous and breath-taking debut novel, which, in my opinion, rivals the likes of The Catcher in the Rye by J.D. Salinger. Seeing as though Catcher is one of my all time favourite novels, it’s no surprise that Solitaire is now also a part of that list. Filled with fandom references and incredibly realistic to teenage life, Solitaire is a book that every teenager will relate to and a book many adults will also love because of its realism and ability to just understand life on so many levels. One of the reasons I loved this novel so much was that I felt as if I was the person in Tori’s head. It scared me in a way because so many of my own feelings were reflected in the writing. Tori, the protagonist, gets me and that made it so special to read. Tori is juxtaposed to Michael Holden, the male protagonist in Solitaire. Before you think it, Solitaire is by no means a love story. Solitaire is a life story, and by that I mean that Solitaire captures life perfectly – life isn’t a love story, is it? Life is so much more than meeting someone and madly falling in love with him or her. I loved that about Solitaire and it’s what sets it apart from your typical YA novel. Written from the heart, I believe Solitaire will be one of the biggest debut novels of 2014. You certainly won’t want to miss out on reading it! Book in a Tweet: If you’re a teenager, or have ever been a teenager, this book has been written just for you: You’re not alone. If you liked …. you’ll love this! 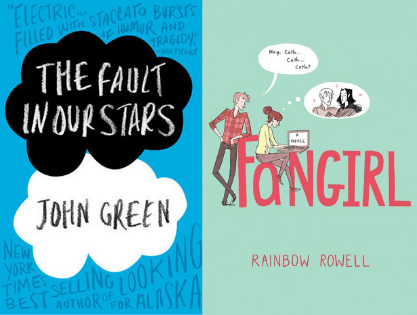 John Green – love The Fault in Our Stars? Mad about Looking for Alaska and Paper Towns? Solitaire easily rivals it! Fangirl by Rainbow Rowell – Full of fandom references that will put a big smile on your face, Solitaire deals with the same feelings as Fangirl but is possibly even better! This is the first I’ve heard of this one but it sounds brilliant! I’ll be investigating this! Oh wow, what a glowing review, I must read this book! Carly Jayne recently posted…Splendid Series. It is, isn’t it? I love the cover so much! I am currently reading this book, and i do enjoy this story so far… Yeay..